Ethiopia is a landlocked country sandwiched between East Africa and North Africa. It is the second most populated nation in Africa and the tenth largest by size. Ethiopia has never been colonized allowing for a unique culture and preserved traditions. Backpacking in Ethiopia is not very common, making this an incredible destination and perfect reason to visit Ethiopia. It is a very cheap country to travel with many beautiful sights. Ethiopia travel has been hampered recently due to some unrest in the country, but don’t make this stop you from heading there. When we arrived to Ethiopia in late 2016, we had no clue about any unrest within the country. A country divided by a major ethnic group that has no role within the government, and the Tigray government were at arms. There have been protests in which people have died, including a few foreigners who unfortunately were in the wrong place at the wrong time. However, the issues in Ethiopia while still exist, are not as heated as they were in 2016. Foreigners were never targeted and it still is a safe country to travel with some precautions. We will touch on those in this guide. In Ethiopia natural beauty runs wild, as the East African Rift system rips through this country, forming beautiful mountains, high plateaus, and highly active volcanoes. Major sights include the rock-hewn Churches in Lalibela and Tigray, the impressive Simien Mountains, the tribes in Omo Valley, and the street hyenas in Harar. There are many places to visit in Ethiopia, but the methods of travel should be investigated if it is safe. A one month Visa is available upon arrival when flying into Addis Ababa for $50 if you are a resident of Europe, USA, Korea, China, and several other countries. For the latest information, please refer to the Ethiopian Embassy website. The main language in Ethiopia is Amharic, yet many tribal languages also exist (Tigrinya, Oromo, Afar). Many speak English, as it is taught in schools across Ethiopia. If you are flying at least one leg into Ethiopia on an Ethiopian Airlines flight, you will qualify for reduced fares on domestic flights. Domestic flights with reduced fares cost between $50 – $90 per flight. Book at an Ethiopian Airlines office on arrival or call a local branch. We recommend flying in Ethiopia between destinations making it a safer journey. Most bus companies in Ethiopia are owned by Tigray companies or the government. During protests and unrest, buses often are a target during riots. They have been known to be attacked by protesters, and while they almost always let passengers off unscathed, they will destroy the bus and burn it in the streets. This caused us alarm, so we flew between all our destinations. 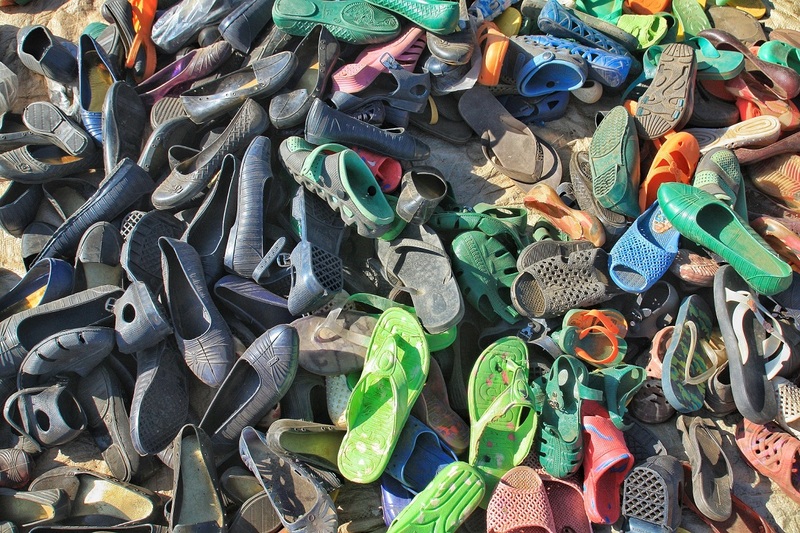 We felt safe during our time in Ethiopia, but this was the one area we felt was too risky. Make sure to ask with locals in Ethiopia how the bus situation is at the time to decide if they are safe to use. Clean and basic accommodation in Addis for a double room starts at 450 Birr ($20) up to 800 Birr ($36). Outside of Addis, rooms are considerably cheaper, with basic hotels including wifi and hot water from 300 Birr ($13) for a double room. Note: Bedbugs and bed fleas are a common issue in Ethiopia and something to be aware of when staying at budget hotels. The only way to kill bedbugs is in high heat (a dryer), and outside of Addis, no one owns or uses dryers, so it is a constant issue in Ethiopia. Theft is a major problem in Ethiopia, especially in Addis Ababa. Addis is the pickpocketing capital of the world. In one day while walking around the Piazza area, we were surrounded four times attempted to be robbed. We knew several backpackers who had their phone or wallet stolen in broad daylight. This problem, unfortunately, is commonly homeless children. They will try to trick you by getting close to you with a piece of paper, kleenex, sneeze on you, or pretend to beg. While this is going on, a group of other children will come from somewhere else and pick-pocket your belongings. To stay safe, just DO NOT bring anything with you while exploring Addis. We carried 1 cell phone and nothing else. I made sure it was in a zipper pocket and guarded it. It is an uncomfortable feeling and a constant nuisance in Addis. Outside of Addis, the problem is not as bad. In some areas such as Tigray, theft is not as common. During the 2016 Rio Summer Olympics, runner Feyisa Lilesa from Ethiopia garnered international attention. When he crossed the finish line, he made a public stance, using his arms to mark an X above his head to protest against the Ethiopian government. As I mentioned earlier, there has been political unrest and several protests that have turned violent. Recently, the situation has been much better since their new prime minister was elected, however, for the latest information, please check your home country’s travel advisories. The capital city is a major hub in Africa and the likely point of entry and exit into Ethiopia. We do not recommend staying long in Addis Ababa. The sights are not very good and the pickpocketing is the worst we have ever seen. 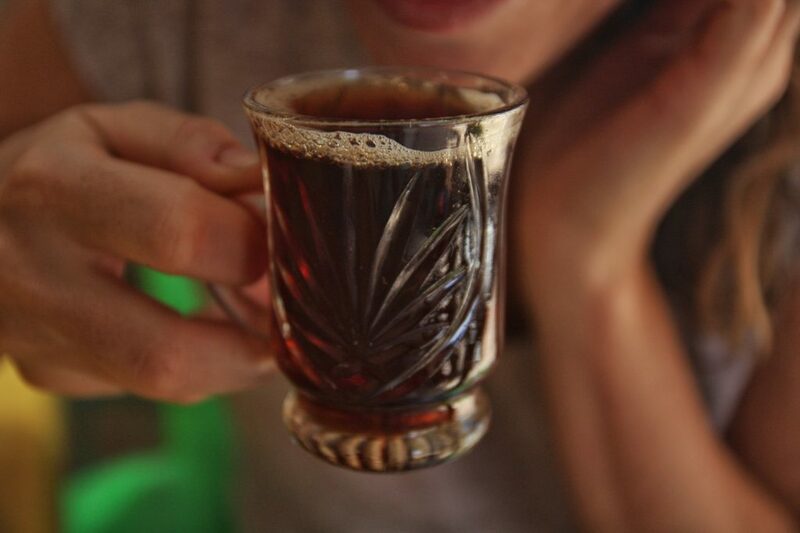 We recommend using it as a quick stop to move on to your destination in Ethiopia. If you do plan to sightsee, check out the Red Terror Museum, St. George Church, the Piazza, and the Merkato. Leave valuables at your hotel, especially when visiting populated areas such as the Piazza and Merkato. Stay: The Bole street area is newer and closer to the airport. It is much safer and cleaner than Piazza with less harassment from the locals. Stay at Mr. Martins (MM) Cozy Place, where en-suite singles are $20 and doubles are $30 or Abel Pension a few blocks away has en-suite rooms with wifi for 500 Birr. Lalibela is in a beautiful mountainous region in northern Ethiopia. Thousands of Coptic Christians pilgrimage here to visit the 900-year-old rock-hewn churches. 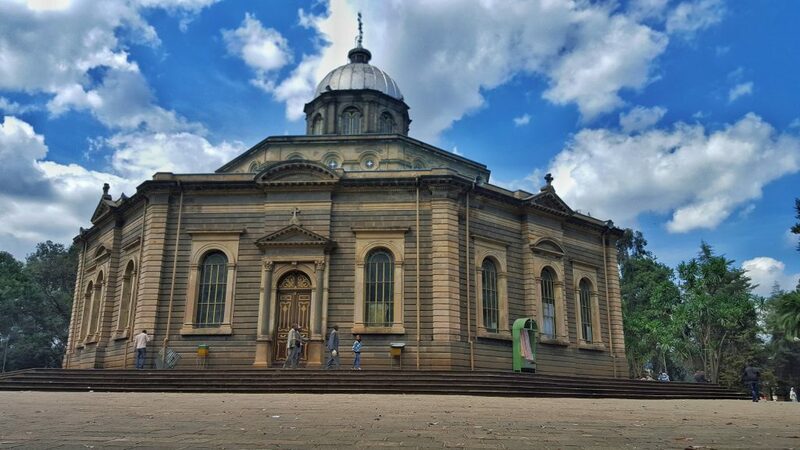 Ethiopia has some of the oldest churches in the world, dating back to the fourth century. During the 12th century, Muslim conquests in the Holy Land pushed out Christianity. 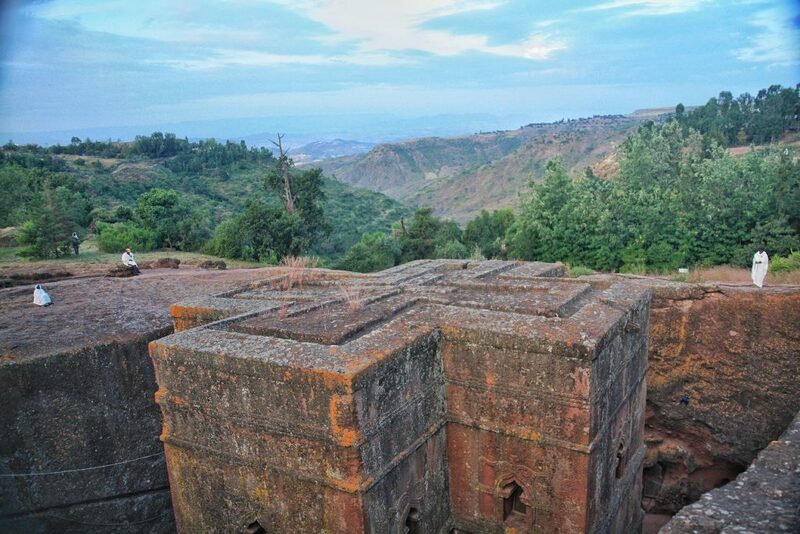 Lalibela took its place, earning the nickname New Jerusalem. 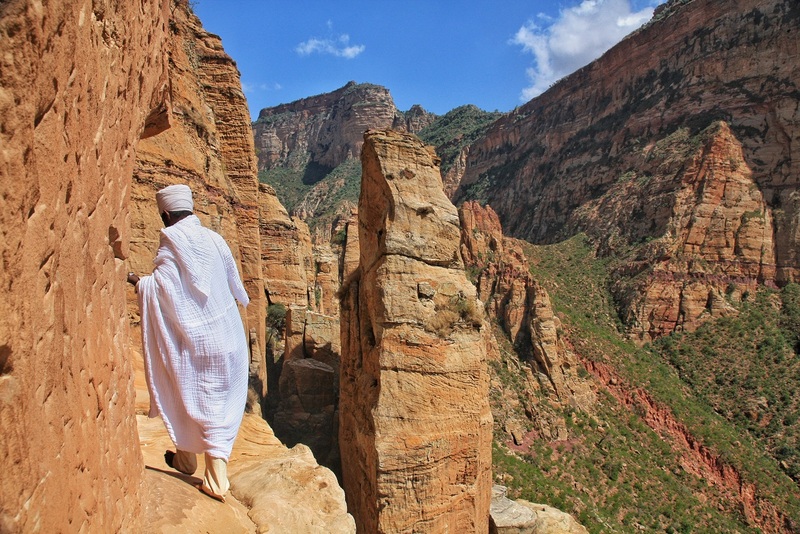 No stop to Ethiopia can be complete without visiting this devout and religious place. 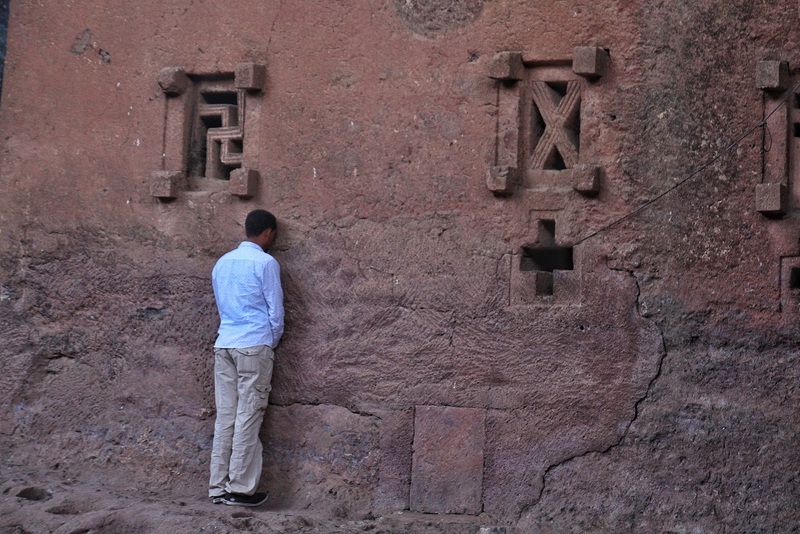 However, the churches are not the only draw in Lalibela. After a full day or two visiting the 11 rock-hewn churches, head out for a community hike to Abuna Yosef mountain. This three-day hike starts in Lalibela, and ventures into the mountains to small villages staying two nights in a traditional mud hut. Read more about the Lalibela churches and community hike to Abuna Yosef. The Danakil Depression is in the northeast corner of Ethiopia, not far from Eritrea. This region is one of the harshest in the world. In one of the lowest elevations (-400 feet / -125 m), this place also is one of the hottest on earth. Due to three tectonic plates meeting at this spot, is has sights unlike almost anywhere else on earth. 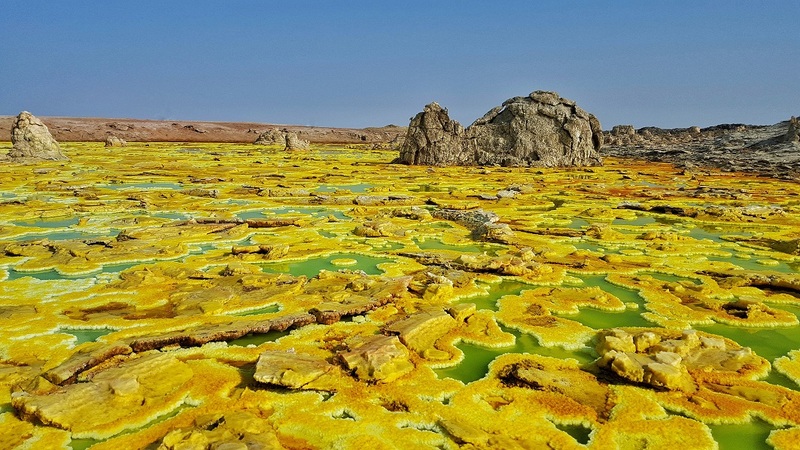 Take a tour to the Danakil with the major stops at the Dallol sulfur springs, watch camel caravan’s to and from the salt lake, and hike up Erta Ale volcano to witness one of only five active lava lakes in the world. Stay: LK Pension in Mekele has clean rooms with en-suite for 300 Birr and shared bath for 200 Birr. 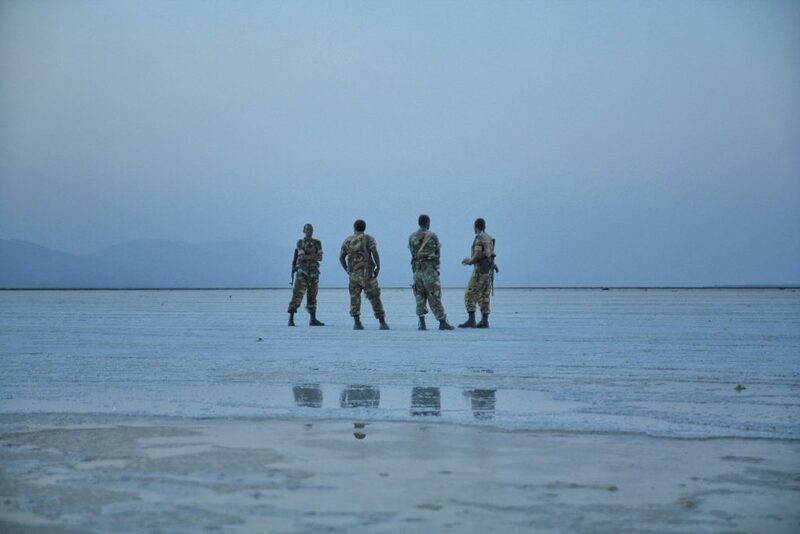 Read more about the Danakil Depression tour here. The Tigray region, the northernmost of Ethiopia, has been a formidable and large part of Ethiopia’s storied past. 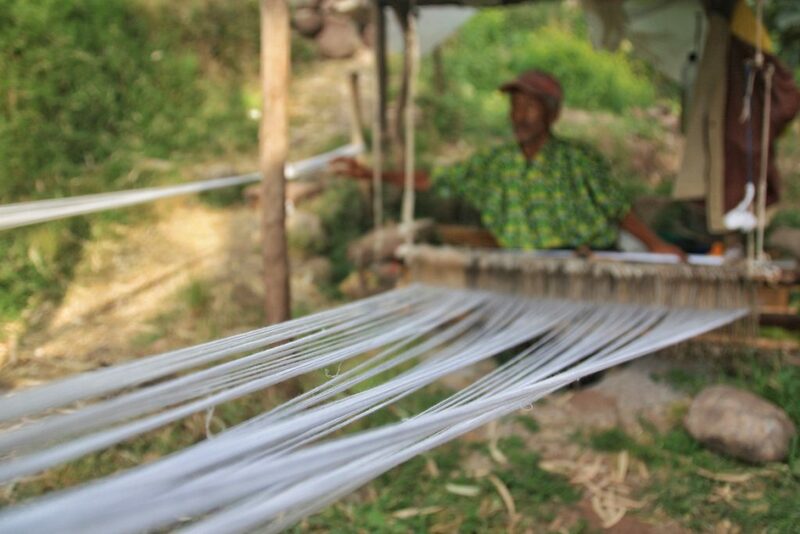 Many activities are in the Tigray region, requiring a stop for a few days. Hit the mountains and go on a hike to a cluster of rock-hewn Churches in Wukro and/or Hawzien. Visit the storied past and ruins of Yeha. 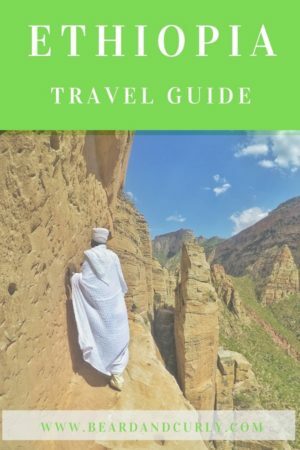 Climb up a cliff face with the assistance of a monk to one of the most famous monasteries, Debre Damo (only men are allowed). Check out the tombs, obelisks and of course, the current location of the Ark of the Covenant in the city of Aksum. Read more about the Tigray rock-hewn churches here. Head to Gondar and the Simien Mountains for a multi-day trek into vast wilderness and craggy peaks surrounded by lush green valleys. Hikes are between two to ten days. It is possible to hike from Simien to Lalibela. Hiking in this region is strenuous and very remote. Getting a guide or scout is required by the Ethiopian government. If you book ahead with a tour company, guides are expensive and can cost almost $100 USD per day. However, if you are on a budget, it is much cheaper if you organize at the park entrance. The park office is in Debark, where the hike also begins. At the park office, you can ask for a scout (not a guide) and a mule (i.e. local porter). You can save more than half your money by booking on your own and not hiring a full team to support you. Agree to a price with the scout and porter, and pay park fees of 90 Birr per person and 40 Birr each night tent camping. 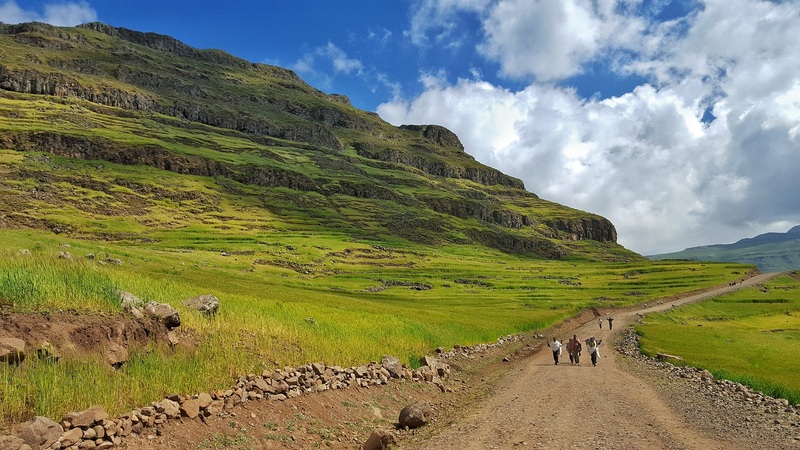 For a full guide on hiking in the Simien Mountains, check out this great article by the Divergent Travelers. Visit this UNESCO World Heritage City to enjoy a different experience from the rest of Ethiopia. Harar, a walled city, is predominately Muslim, and home to many mosques, markets, and lively vendors. A walk through the small alleyways will take you back in time. The Jegol Wall is a great place to walk around. Also, check out the city hyenas and a long-standing tradition where you can feed meat to the hyenas yourself. Harar is also the gateway to overland into Somaliland for adventurous backpackers. Tip: Click here for more info on Harar. In the southern part of Ethiopia, the Omo Valley is home to many Ethiopian ethnic groups, known for their eclectic piercings, tattoos and body paintings. 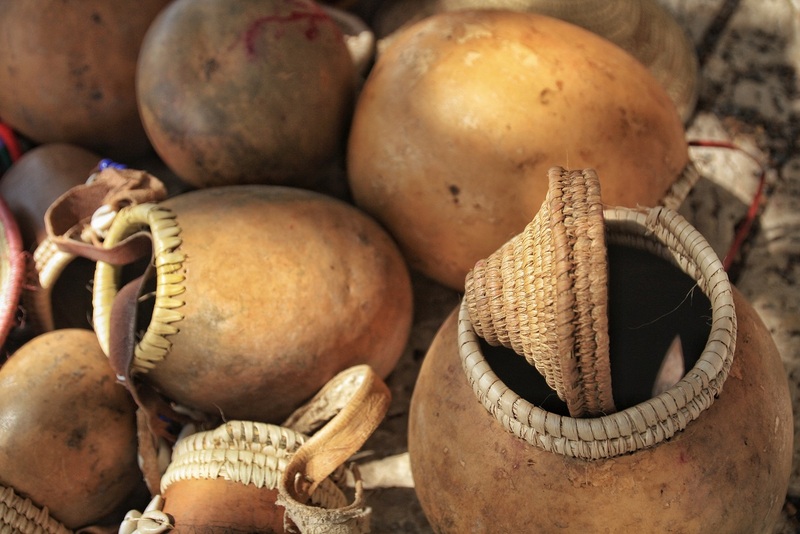 Believed to be some of the most fascinating tribes left in Africa, this also has become a major tourist destination. Inflated prices (tours upwards of $600 per person) and additional costs for photography of each person are often reasons some skip this region altogether. However, you will get a cultural experience that is nearly lost in all of Africa. *If you are considering buying any camping gear, hiking gear, or photography gear, please consider buying through the below affiliate links on this page. You won’t pay for anything extra at all, but we will receive a small commission (usually 2%-5%) to help run the website. We appreciate the support! Great information on Ethiopia… Thank you. I already did hours and hours of research, especially in terms of various tours. 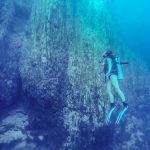 Though the prices that I could find out are significantly higher – even when inquiring with certain guides or tour companies. So my question would be. Especially for Omo, Danakil and Simien: How did you do that? Did you just get yourself organised on site? I’d be very thankful for any advice. Tours and pricing will be higher when searching and contacting from the US or Europe. These tours go all the time with space and last minute bookings. We booked everything once we were in Ethiopia and you save a lot of money by doing that. Hope that helps, good luck with the planning! We added some new content to Ethiopia. We did not go to Omo and Simien, but we have information for Danakil on how to book, etc… Hope it helps. I have a friend that was originally from here. I would love to visit some day. Especially the Danakil Depression. So many places so little time. I would like to visit all the places that you have listed here. Brilliant description and pictures. You make Ethiopia seem so exotic! Funny story. When people ask me where I’m from, I always tell them Ethiopia. lol I have a friend who was from Ethiopia and I thought she was the most beautiful person on the planet! PLUS – the food is amazing! Loved this post! The people in Ethiopia are stunning! And I agree the food is awesome too! Glad you enjoyed the post. Such a great read! 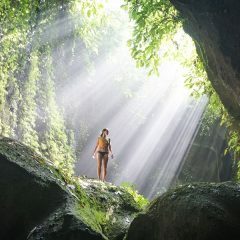 I want to visit the place soon and it’s amazing! Never thought that Ethiopia is such a beautiful, diverse country packed full of history, scenery and some of the lesser-known animal wonders on the African continent. Yep. When I first thought of Ethiopia I imagined desert but it’s not like that at all. It’s incredibly lush and full of mountains. It’s really a beautiful place! I would love to visit one day. These photos are really stunning! this is so thorough and well done. i would love to make this trip! I saw Lucy at a museum in France – so incredible to see such a remarkable piece of history! Wow!! Such a great read. It looks like a great place to visit. I hope someday will visit ethiopia. Glad you enjoyed the read. Ethiopia is a wonderful place with so much history. Hope you get to enjoy it there one day. Thank you for your detailed post on Ethiopia. 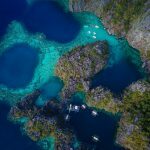 I am in the process of booking a trip using ETT Travel and so was looking for independent reviews of them and stumbled on your blog – so glad you had a positive experience! This article is well detailed. Good read. I know this was a few years back but do you happen to have more info for harar?!?! Prices, where to stay?